How can abortion rights be more effectively defended? Although the biblical case against abortion is weak, the religious right has gained much traction against abortion rights in the last decade or two. 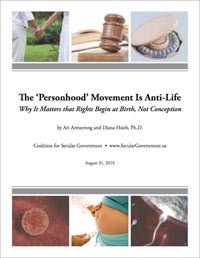 The "personhood" movement is growing every year, and incremental restrictions on abortion have mushroomed. Even more alarming, the demographics seem to be against abortion rights: young people are increasingly opposed to abortion. What can be done to more effectively defend abortion rights? Can any lessons be drawn from the success of the campaign for gay marriage? My Answer, In Brief: The advocates of abortion bans are largely motivated by the divine command, "Thou Shalt Not Kill," which is then often cast in the language of the "right to life." To combat that, those people need to be confronted with the reality of what abortion bans mean to women and couples. A podcast of the full episode – where I answered questions on the philosophy of Immanuel Kant, being virtuous but not happy, defending abortion rights, and more – is available here: Episode of 20 April 2014. Can a rational atheist extract any value from studying theology? Theology includes a mix of arguments for the existence of God, plus views on ethics, and more. It's the earliest form of philosophy. Can a person benefit by cherry picking ideas from theological teachings or does the mysticism and other faults outweigh any benefits? My Answer, In Brief: A rational atheist can extract quite a bit of value from studying the arguments for the existence of God, religious scriptures, and contemporary religious beliefs and practices. He can better his understanding of the culture, become more culturally literate, understand people better, and develop well-justified views on religion. A podcast of the full episode – where I answered questions on evolution's ethical implications, cultivating a healthy body image, the value of studying theology, and more – is available here: Episode of 30 March 2014.